There are two forms of diabetes mellitus, type 1 diabetes and type 2 diabetes. According to the CDC, diabetes affects more than 20 million Americans over the age of 18. Diabetes affects more than 20 million Americans over the age of 18, according to the Centers for Disease Control and Prevention. There are two forms of diabetes mellitus, namely type 1 diabetes and type 2 diabetes. Type 1 Diabetes occurs in children as a result of autoimmune destruction of insulin producing cells in the pancreas. These children are unable to produce their own insulin, but can respond to insulin injections. This is now a very treatable condition. Type 2 Diabetes occurs in adults as a result of cellular insulin resistance. This form is much more difficult to manage because the body can still produce insulin, but the cells are unresponsive to it. This can lead to life-threatening hypoglycemia and secondary conditions. Insulin is a hormone produced by the pancreas after a meal. Insulin directs cells to take up glucose from the blood to be used as an energy source and to be stored for later use as glycogen. Insulin helps prevent hyperglycemia (excess blood glucose) and keeps cells from breaking down stored energy, when there is free glucose available for use. Additionally, it encourages the storage rather than breakdown of other energy sources like fats. Glucagon, which is also released by the pancreas, opposes the actions of insulin to prevent hypoglycemia (low blood sugar). Glucagon encourages cells to break down stored energy for use during fasting. When blood glucose levels fall during intervals between meals, or overnight during sleep, glucagon ensures that stored energy keeps important organs supplied with plenty of energy. It is important that insulin and glucagon levels are carefully balanced to keep blood sugar levels steady. Rapid drops in glucose levels can cause physical effects like tremors, sweating, dizziness, heart palpitations, seizures, comas, and even death. 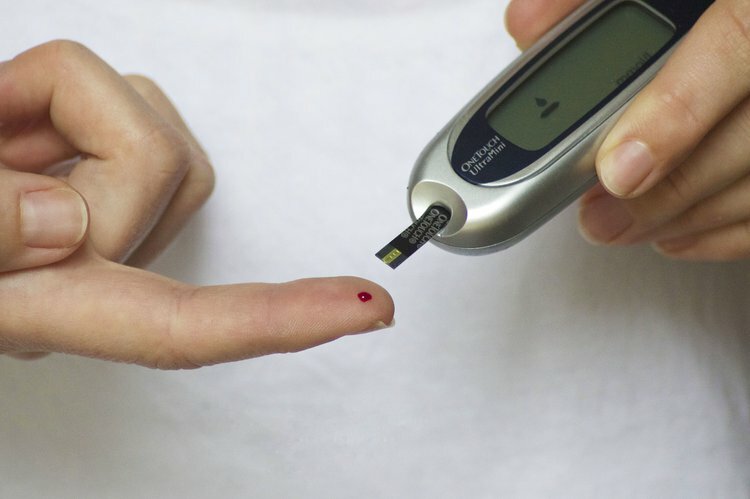 Excess blood glucose is also dangerous because it can cause fatigue, confusion, increased thirst and urination, weight loss, and increased ketone bodies. When cells cannot respond to insulin, they constantly believe that there is no food available, so they break down all their stored energy. While cells are breaking down stored energy, glucose levels build up in blood because cells do not realize they can take it up. When stored glucose runs out, cells have to rely on other sources like fats. However, some organs, such as the brain, can only use glucose as energy, which can lead to many complications. Another result of diabetes is ketoacidosis, or the lowering of the pH of blood. This is caused by excess ketone bodies released by the liver to deliver energy to peripheral tissues. Low blood pH is dangerous because there is a very narrow pH range that is safe for cells, and lowered pH can cause damage and cellular dysfunction. Further complications of diabetes are blindness, increased risk for infection, reduced ability to heal, amputation, kidney damage, and nerve damage. Those at the greatest risk for developing type 2 diabetes are smokers, overweight and obese individuals, as well as those who do not exercise, have high blood pressure, and high cholesterol levels. There are some people with genetic predispositions for developing type 2 diabetes, but the onset can be delayed or prevented for many individuals through lifestyle changes. Exercise: Increasing the time spent on daily exercising has been shown to reduce the risk of diabetes and help improve the health of those already suffering from it. Exercise helps muscles to better uptake glucose and keep blood glucose levels steady. Lose weight: Obesity is one of the leading risk factors for developing diabetes. By losing weight, individuals can lower their risk. According to the Harvard School of Public Health, obese people are 20-40 times more likely to develop diabetes. Eat healthy proteins: According to the Harvard School of Public Health, daily consumption of red meat increases the risk of developing diabetes. Incorporating poultry, fish, nuts, or low fat dairy as protein sources into one’s diabetic diet can lower the risk by about 35%. Eat healthy fats: Polyunsaturated fats from vegetable oil, olive oil, nuts, and seeds can help prevent diabetes. Eating trans fats can increase the risk. Avoid sugary drinks: Drinks like soda, juices, and other sweetened drinks have very high amounts of sugar. By drinking water, coffee, or tea without added sugars, one can cut the sugar intake and reduce the risk of developing diabetes. Learning how to reduce blood sugar and how to control diabetes are vital components in maintaining a diabetic’s health. Ratner, R. E., & Prevention Program Research Group, D. (2006). An update on the diabetes prevention program. Endocrine Practice, 12(Supplement 1), 20-24. Lindström, J., Ilanne-Parikka, P., Peltonen, M., Aunola, S., Eriksson, J. G., Hemiö, K., ... & Louheranta, A. (2006). Sustained reduction in the incidence of type 2 diabetes by lifestyle intervention: follow-up of the Finnish Diabetes Prevention Study. The Lancet, 368(9548), 1673-1679. Ramachandran, A., Snehalatha, C., Mary, S., Mukesh, B., Bhaskar, A. D., & Vijay, V. (2006). The Indian Diabetes Prevention Programme shows that lifestyle modification and metformin prevent type 2 diabetes in Asian Indian subjects with impaired glucose tolerance (IDPP-1). Diabetologia, 49(2), 289-297. Diabetes Prevention Program (DPP) Research Group. (2002). The Diabetes Prevention Program (DPP) description of lifestyle intervention. Diabetes care, 25(12), 2165-2171. Orchard, T. J., Temprosa, M., Goldberg, R., Haffner, S., Ratner, R., Marcovina, S., & Fowler, S. (2005). The effect of metformin and intensive lifestyle intervention on the metabolic syndrome: the Diabetes Prevention Program randomized trial. Annals of internal medicine, 142(8), 611-619.